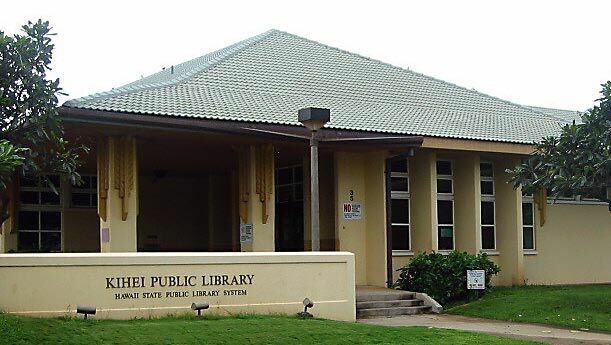 Welcome to the Kihei Public Library! Our current 18,700 sq.-ft. library building opened on Apr. 24, 1996. 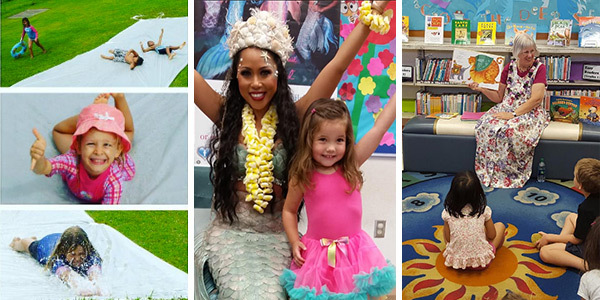 With more than 22,000 registered patrons, we have the second highest circulation figures in Maui County. A traditional Hawaiian fishing shrine featured on the South Maui Heritage Trail is located outside the library. Simple stories, songs, movement and crafts just right for toddlers! Children must be accompanied by a parent or adult caregiver. Stories, songs, movement and crafts especially for preschoolers! Program is subject to change. If you require an auxiliary aid or accommodation due to a disability, please contact the library at least 7 days before the program date. Wear your PJs and fuzzy slippers, grab your teddy bear and come on in to enjoy an evening of stories and fun. Geared for ages 3-7. Children must be accompanied by a parent or adult caregiver. Program schedule is subject to change. Contact the library 15 days in advance to request a sign language interpreter or if special accommodations are needed. Singers from the Hawaii Opera Theatre (HOT) Resident Studio Ensemble will perform a variety of classical favorites. 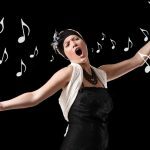 HOT produces professional opera of the highest artistic quality. HOT has been producing opera in Hawaii for over 33 years, blending local talent with outstanding guest artists. This free 45-minute program is suitable for ages 5 and older. Young children must be accompanied by a parent or adult caregiver. Sponsored by the Maui Friends of the Library. This is a production of the University of Hawaii at Manoa Outreach College’s Statewide Cultural Extension Program with funding provided by the National Endowment for the Arts, Hawaii State Foundation on Culture and the Arts, and the University of Hawaii at Manoa. Just before the Summer Reading Program starts on June 1st, come in and pick out a prize from the Treasure Box! (There’s a treasure box for toddlers too). 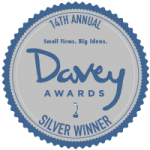 Prizes are small toys, trinkets, “gems” and little surprises. You can pick out one prize each day you visit the library from May 1-31. Prizes courtesy of the Kay A. Edwards Memorial Fund. This library branch will be participating in Free Comic Book Day on May 4th. Meet Comic Book Artist James Silvani for Free Comic Book Day! Meet JAMES SILVANI, a Kihei-based comic book artist and author of Draw-a-Saurus. 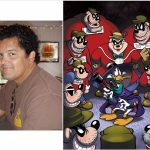 His credits include Disney’s Darkwing Duck as well as The Muppets, Ducktales, Dreamworks’ How To Train Your Dragon, Penguins of Madagascar, Warner Brothers’ Animaniacs and the Teenage Mutant Ninja Turtles. He also illustrates Muppet storybooks and creates exclusive Disney and Star Wars fine art for Acme Archives. Line up to get a free comic sketch. 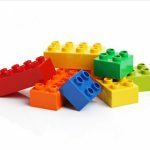 Come enjoy an evening of LEGO® play. Get your creative juices flowing and build creations based on a theme (to be announced at the program). Show off what you can do and see what others come up with. All materials supplied, and LEGO® creations will remain on display for 3 weeks following the program. Young children must be accompanied by an adult caregiver. Sponsored by the Kay A. Edwards Memorial Fund. Get ready for Fresh Family Fun with The Springmans! 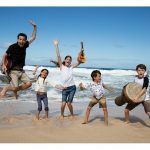 This award-winning, ukulele-strumming musical group is made up of proud dad, Perry Springman, and his four talented kids: Emma, 14, Ryan,12, Sarah, 9, and Jacob, 8. Since the 2016 launch of their first children’s album, Happy Beach, The Springmans have been bringing joy to audiences of all ages across North America. Packed with upbeat, original songs like “Chimichanga,” “Unh Uh No Way,” “Bouncy Bouncy” and “The 3 Minute Clean-up,” Happy Beach received a National Parenting Products Award and a Canadian Covenant Award for “Best Children’s Album of the Year” and was recommended by the Parents’ Choice Foundation as “a likeable collection celebrating kindness, appreciation, family and gratitude.” Come join The Springmans on a “happy beach without end”! Sponsored by Maui Friends of the Library. Love Star Wars? 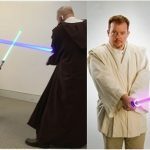 Come join Jedi Jim (Jim Manning, aka “Jungle Jim”) for Star Wars Jedi Knight Training, including Jedi Force Magic, the Laser Balloon Barrage and an epic lightsaber duel! 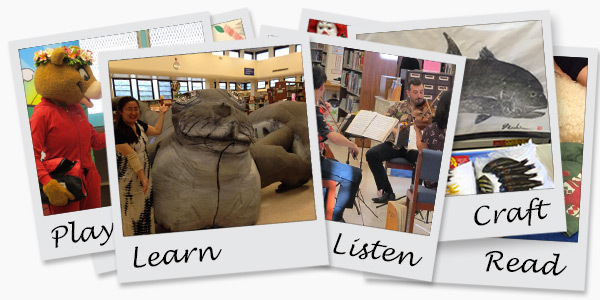 As part of the 2019 Summer Reading Program, ”A Universe of Stories,” Jedi Jim encourages literacy and reinforces the joy of being at the library. Get ready for fun… magic, comedy, balloons and audience participation, just right for 4 – 9 year olds. 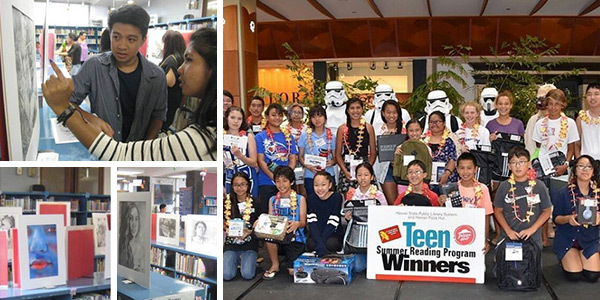 Sponsored by Maui Friends of the Library and the Kay A. Edwards Memorial Fund. Program is subject to change. If you require an auxiliary aid or accommodation due to a disability, please contact he library at least 7 days before the program date.